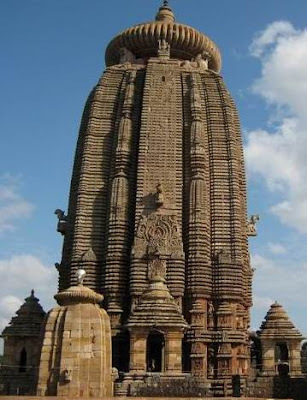 Lingaraj Temple is one of the oldest temples of Bhubaneswar, in Orissa. This thousand years old temple, dedicated to Lord Shiva, is an outstanding specimen of the Orissa style of temple building. Lingaraj Temple is the largest temple of Bhubaneswar - the highly revered Hindu pilgrimage center famous as “the city of temples” or “Temple City of India”. Lord Shiva is enshrined as ‘Lingaraj' means 'the king of Lingas', where 'linga' is the phallic form of Lord Shiv. One of the noted feature of the Lingaraja temple is that Lord Ram have worshipped Goddess Shakti and Lord Shiva at the Lingaraj Temple and had received boons to demolish demon Ravana. Ashoka Ashtami Festival is celebrated every year on the eighth day of the Chaitra month in memory of Lord Rama’s victory. The presiding deity in the sanctum sanctorum is 'Swayambhu Linga' (Self originated), a symbol of half Shiva and half Vishnu. This is the unique feature of the Lingaraj Temple as the harmony of Shivaites and Vaishnavites is seen in this temple. Lord Lingaraj is worshipped here as Hari-Hara, a combined form of Lord Vishnu and Lord Shiva. The idol is a huge granite stone, which is about 8 feet in diameter, placed in a platform. The 'Lingam' is bathed daily with water, milk and bhang (Marijuana). An image of Lord Ganesha is situated to the south, at the back is the image of Goddess Parvati, and Lord Kartikeya is sent to the north. The stone carvings, pillars and halls of the temple are added attractions of the temple. Lingaraj Temple also has lots of other shrines and small temples inside the vast courtyard. The 11th century Lingaraj Temple was built by the King Jajati Keshari, representing the Kalinga style of architecture. Surrounded by massive walls with beautifully carved sculptures, the temple stands to a height of 180 ft. The temple complex is filled with 150 small shrines dedicated to several Hindu Gods and Goddesses. Erected in red sandstone, the temple is located around the vast Bindu Sagar Lake. The temple comprises four structures, namely, the Bhogamandapa (the dining hall), the Natamandapa (the dancing hall), the Jagamohana (the audience hall) and the Deula (the hall that houses Lord Shiva). The tower of the temple is a conical structure shaped like a beehive. At the entrance of the temple is the 'Simha Dwara' (the Lion's Gate), where lions are seen on both the sides, holding the elephants under their feet. Some inscriptions are also seen in the temple. The noted feature of the temple is that, on top of the temple there is no trishula (trident - the primary weapon of Shiva) or Chakra (discus – the main weapon of Lord Vishnu). The temple only has an arrow symbol - the reason behind this may be because Lord Ram was a worshipper of Lord Shiva and is said to have performed pujas at the Lingaraj Temple. The main gates of the Lingaraj Temple have images of Trishula on one side and Chakra on the other side. According to mythology, Lord Shiva once told Goddess Parvati that he likes Bhubaneshwar (referred as Ekamra Kshetra according to Bhrama Purana) more than Benaras. As such, Parvati decided to have a glance at the city, and changed herself as a cowherd. Two demons, named Kritti and Vasa, expressed their desire to marry her. She ordered them to carry her upon their shoulders and they agreed. Parvati sat on their shoulders and crushed them. On seeing this, Shiva created a lake called Bindu Sagar to put out her thirst and resided there as Lingaraja. Ashoka Ashtami Festival or Ashokashtami Festival is the main festival celebrated at the The Lignaraj Temple. The festival falls on the eighth day of the Chaitra month (March – April) to commemorate the victory of Lord Rama over demon Ravana. Read more information on Ashokashtami Festival here. Bhubaneshwar is well connected by rail (Bhubaneswar Junction), road and airways (Biju Patnaik Airport) to various parts of the country. Bhubaneswar is home to lots of ancient Hindu Temples, parks, and historical monuments. The Ananta Vasudeva Temple is situated about 4 km from the temple. Bhaskareswar Temple is located at a distance of about 6 km. Bindusagar Lake is about 4 km is located north of the Lingaraj Temple. Located about 7 km west of Bhubaneswar is the Khandagiri and Udaygiri Caves, a major Orissan historical monument famous for the wide variety of rock-cut caves built for the Jain monks around 1st - 2nd century B.C.